QuakeWrap® products usually result in cost savings in all construction projects. While FRP materials are more expensive than conventional construction materials, their installation requires fewer labor hours and limited equipment. In addition, because the materials need not be custom-fit prior to delivery to the job site, no delays will occur as a result of having the wrong size product on the construction site. These advantages are even further amplified with our new patent-pending products such as the PipeMedic® and PileMedic® products. 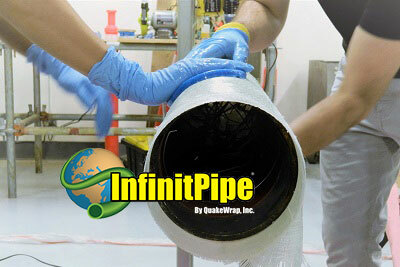 QuakeWrap® products can be installed very rapidly with a small crew. Because no prefabrication of retrofit is necessary, the crew can be mobilized quickly and work can begin immediately. This results in major time-savings compared to retrofit with conventional materials and techniques. In particular, the recently developed PileMedic® jackets offer major advantages in this regard. These jackets are so versatile that can be wrapped around columns and piles of virtually any size and shape to create a shell. A single sheet can be used to repair columns of any size; this saves time both in ordering and acquisition of materials as well as during the installation on site. A major advantage of FRP is in projects where access is limited, such as hospital floors, occupied buildings, industrial buildings where mechanical equipment and pipes exist, etc. In these situations, the flexibility of the FRP allows it to be passed through narrow openings, without the need to remove the existing attachments to the building. This leads to significant cost- and time-savings on many projects. In addition, the odorless and non-toxic resins we have developed allow for faster and safer construction in tight and/or occupied spaces. Our newly developed PileMedic® jackets allow repair of submerged piles without the need for construction of coffer dams or costly divers. These products offer significant cost advantages compared to other conventional repair materials and techniques.